These are dangerous assumptions to make today, with the BabyBoomer-led SuperCycle fast receding into history. “The process of listing will completely change the character of the company and demand a new openness from its senior management“. MbS is still making good progress with his domestic policy reforms. Women, for example, are finally due to be allowed to drive in June and modern entertainment facilities such as cinemas are now being allowed again after a 35 year ban. But unfortunately, over the past 2 years, Saudi oil policy has gone backwards. Restructuring the Saudi economy away from oil-dependence was always going to be a tough challenge. And the pace of the required change is increasing, as the world’s consumers focus on sustainability and pollution. 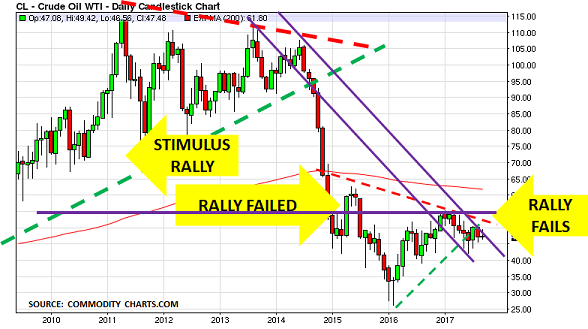 It is, of course, easy to miss this trend if your advisers only listen to bonus-hungry investment bankers, or OPEC leaders. But when brand-owners such as Coca-Cola talk, you can’t afford to ignore what they are saying – and doing. Similarly, MbS’s advisers seem to be completely ignoring the likely implications of China’s ‘War on Pollution’ for oil demand – and China is its largest customer for oil/plastics exports. Already the European Union has set out plans to ensure “All plastic packaging is reusable or recyclable in a cost-effective manner by 2030”. And in China, the city of Shenzhen has converted all of its 16359 buses to run on electric power, and is now converting its 17000 taxis. Whilst the city of Jinan is planning a network of “intelligent highways” as the video in this Bloomberg report shows, which will use solar panels to charge the batteries of autonomous vehicles as they drive along. As the chart at the top confirms, oil’s period of energy dominance was already coming to an end, even before the issues of sustainability and pollution really began to emerge as constraints on demand. This is why MbS was right to aim to move the Saudi economy away from its dependence on oil within 20 years. Aramco is making major strides towards becoming a more open company. But when it comes to the flotation, investors are going to look carefully at the real outlook for oil demand in the critical transport sector. And they are rightly going to be nervous over the medium/longer-term prospects. They are also going to be very sceptical about the idea that plastics can replace lost demand in the transport sector. 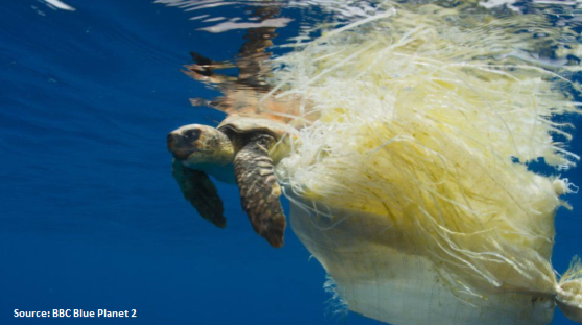 Already 11 major brands, including Coke, Unilever, Wal-Mart and Pepsi – responsible for 6 million tonnes of plastic packaging – are committed to using “100% reusable, recyclable or compostable packaging by 2025“. We can be sure that these numbers will grow dramatically over the next few years. Recycled plastic, not virgin product, is set to be the growth product of the future. The post Saudi oil policy risks creating perfect storm for Aramco flotation appeared first on Chemicals & The Economy. 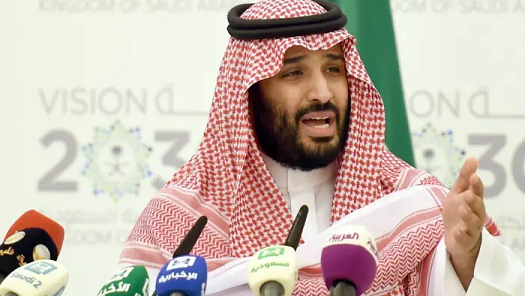 Saudi Arabia’s move into recession comes at an unfortunate time for its new Crown Prince, Mohammed bin Salman (known to all as MbS). Unemployment is continuing to rise, threatening the social contract. In foreign affairs, the war in Yemen and the dispute with Qatar appear to be in stalemate. And then there is the vexed issue of King Salman’s ill health, and the question of who succeeds him. The problems began a few months later after he abruptly reversed course and overturned former oil minister Ali al-Naimi’s market share policy by signing up to repeat the failed Opec quota policy of the early 1980s. His hope was that by including Russia, the new deal would “rebalance” oil markets and establish a $50 a barrel floor under prices. In turn, this would boost the prospects for his proposed flotation of a 5 per cent stake in Saudi Aramco, with its world record target valuation of $2tn. 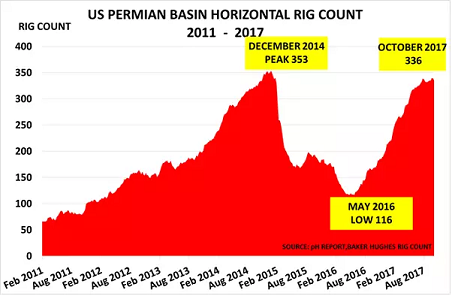 But, as the chart above shows, the volte face also handed a second life to US shale producers, particularly in the Permian basin, which has the potential to become the world’s largest oilfield. Its development had been effectively curtailed by Mr Naimi’s policy. The number of high-performing horizontal drilling rigs had peaked at 353 in December 2014. By May 2016, the figure had collapsed to just 116. But since then, the rig count has trebled and is close to a new peak, at 336, according to the Baker Hughes Rig Count. Even worse from the Saudi perspective is that oil production per Permian rig has continued to rise from December 2014’s level of 219 barrels a day. Volume has nearly trebled to 572 b/d, while the number of DUC (drilled but uncompleted) wells has almost doubled from 1,204 to 2,330. 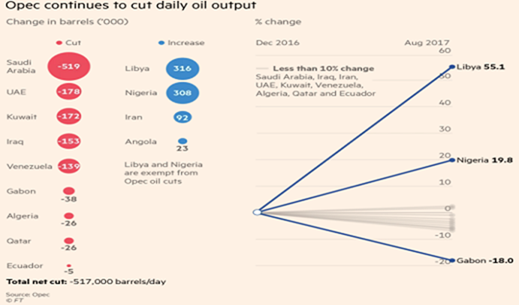 Equally disturbing, as the second chart from Anjli Raval’s recent FT analysis confirms, is that Saudi Arabia has been forced to take the main burden of the promised cutbacks. Its 519,000 b/d cut almost exactly matches Opec’s total 517,000 b/d cutback. Of course, other Opec members will continue to cheer on Saudi Arabia because they gain the benefit of higher prices from its output curbs. But we would question whether the quota strategy is really the right policy for the Kingdom itself. A year ago, after all, Opec had forecast that its new quotas would “rebalance the oil market” in the first half of this year. When this proved over-optimistic, it expected rebalancing to have been achieved by March 2018. Now, it is suggesting that rebalancing may take until the end of 2018, and could even require further output cuts. Producers used to shrug off this development, arguing that demand growth in China, India and other emerging markets would secure oil’s future. But they can no longer ignore rising concerns over pollution from gasoline and diesel-powered cars. India has already announced that all new cars will be powered by electricity by 2030, while China is studying a similar move. China has a dual incentive for such a policy because it would not only support President Xi Jinping’s anti-pollution strategy, but also create an opportunity for its automakers to take a global lead in electric vehicle production. It therefore seems timely for Prince Mohammed to revert to his earlier approach to the oil price. The rebalancing strategy has clearly not produced the expected results and, even worse, US shale producers are now enthusiastically ramping up production at Saudi Arabia’s expense. 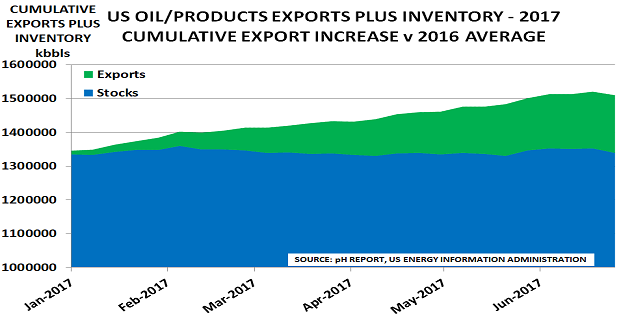 The kingdom’s exports of crude oil to the US fell to just 795,000 b/d in July, while US oil and product exports last week hit a new record level of more than 7.6m b/d, further reducing Saudi Arabia’s market share in key global markets. The growing likelihood that oil demand will peak within the next decade highlights how Saudi Arabia is effectively now in a battle to monetise its reserves before demand starts to slip away. Geopolitics also suggests that a pivot away from Russia to China might be opportune. The Opec deal clearly made sense for Russia in the short term, given its continuing dependence on oil revenues. But Russia is never likely to become a true strategic partner for the kingdom, given its competitive position as a major oil and gas producer, and its longstanding regional alliances with Iran and Syria. China, however, offers the potential for a much more strategic relationship, which would allow Saudi Arabia as the world’s largest oil producer to boost its sales to the world’s second-largest oil market. China also offers a potential solution to the vexed question of the Saudi Aramco flotation, following the recent offer by an unnamed (but no doubt state-linked) Chinese buyer to purchase the whole 5 per cent stake. This would allow Prince Mohammed to avoid embarrassment by claiming victory in the sale while avoiding the difficulties of a public float. The Chinese option would also help the kingdom access the One Belt, One Road (OBOR) market for its future non-oil production. This option could be very valuable, given that OBOR may well become the largest free-trade area in the world, as we discussed here in June. In addition, and perhaps most importantly from Prince Mohammed’s viewpoint, the China pivot might well tip the balance within Saudi Arabia’s Allegiance Council, and smooth his path to the throne as King Salman’s successor. Paul Hodges and David Hughes publish The pH Report. The post Saudi Arabia’s ‘Vision 2030’ is looking a lot less clear appeared first on Chemicals & The Economy. There was never any logic for commodities to become a separate new asset class. A share in a company has some value even if the management are useless and their products don’t work properly. Similarly bonds pay interest at regular intervals. But oil does nothing except sit in a tank, unless someone turns it into a product. The impact of all this paper trading was enormous. Last year, for example, it averaged a record 1.1 million contracts/ day just in WTI futures on the CME. Total paper trading in WTI/Brent was more than 10x actual physical production. Inevitably, this massive buying power kept prices high, even though the last time that supplies were really at risk was in 2008, when there was a threat of war with Iran. Hall seemed unaware that his statement exactly described the role of price discovery. Markets are not there to provide guaranteed profits for commodity funds. Their role via price discovery is to help buyers and sellers balance physical supply and demand, and make the right decisions on capital spend. By artificially pushing prices higher, the funds have effectively led to $bns of unnecessary new capital investment taking place. The problem today is that markets – which means suppliers and consumers – will now have to pick up the pieces as the funds depart. And it seems likely to be a difficult period, given the length of time in which financial players have ruled, and the distortions they have created. Major changes are already underway in the physical market, with worries over air quality and climate change leading France, the UK, India and now China to announce plans to ban sales of fossil-fuelled cars. Transport is the biggest single source of demand for oil, and so it is clear we are now close to reaching “peak gasoline/diesel demand“. OPEC obviously stands to be a major loser. Over the past year, the young and inexperienced Saudi Crown Prince Mohammed bin Salman chose to link up with the funds. His aim was keep prices artificially high via an output quota deal between OPEC and Russia. But history confirms that such pacts have never worked. 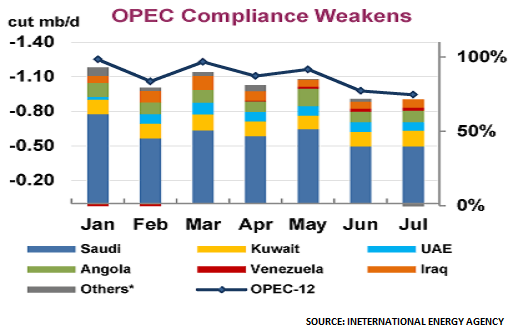 This time is no different as the second chart from the International Energy Agency shows, with OPEC compliance already down to 75%. Consumers will also pay, as they have to pick up the bill for the investments made when people imagined oil prices would always be $100/bbl. And consumers, along with OPEC populations, will also end up suffering if the shock of lower oil prices creates further geopolitical turmoil in the Middle East. The rule certainly seems to be working today, as the catastrophe of Hurricanes Harvey, Irma and Jose creates devastation across the Caribbean and the southern USA. 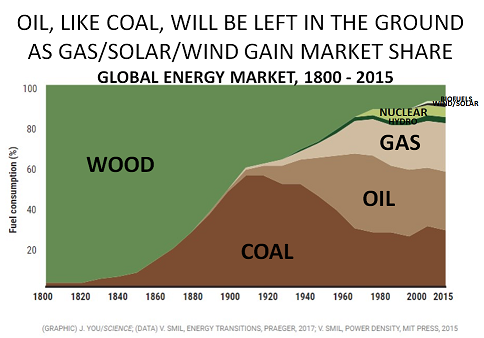 Not only is this reducing short-term demand for oil, but it will also turbo-charge the move towards renewables. Mllions of Americans are now going to want to see fossil fuel use reduced, as worries about the impact of climate change grow. “Dozens of hedge-fund managers and oil traders attended a series of closed-door meetings in recent months with OPEC leaders—the first of their kind, according to Ed Morse, Citigroup Inc.’s global head of commodities research, who helped organize some of the events. In a sign of the times, Hall has told his investors that he expects “high levels of inventories” to persist into next year. Consensus forecasts in April/May that prices would rally $10/bbl to $60/bbl have long been forgotten. This therefore has the potential to be a big moment in the oil markets and, by extension, in the global economy. The chart above shows what the hedge funds missed in their rush to jump on the OPEC $50/bbl price floor bandwagon. How low oil prices will go as the market now rebalances is anyone’s guess. But they remain in a very bearish pattern of “lower lows and lower highs”. This suggests it will not be long before they go below last year’s $27/bbl price for Brent and $26/bbl for WTI. “Within 20 years, we will be an economy that doesn’t depend mainly on oil“. Equally important is that the aim is to use the IPO to create the world’s largest sovereign wealth fund, which will not only include Aramco itself, but also real estate and other newly-privatised companies. This Public Investment Fund will have a value of between $2tn – $3tn, as the chart shows – meaning it could potentially buy the 4 largest public companies in the USA – Apple, Alphabet (Google), Microsoft and Berkshire Hathaway. “Invest half its holdings overseas, excluding the Aramco stake, in assets that will produce a steady stream of dividends unmoored from fossil fuels”. “Beserk…with between 80 to 100 billion dollars of inefficient spending every year, about a quarter of the entire Saudi budget….At last April’s spending levels, Saudi would have gone completely broke by early 2017″. “Transformed from an oil and gas company to an energy/industrial company…We’re targeting many projects. Most important is building the first solar energy plant in Saudi Arabia. Aramco is now the biggest company in the world and it has the capability of controlling the shape of energy in the future and we want to venture into that from today. In their own way, therefore, these new policy statements are likely to be as critical for the global economy as President Xi Jinping’s speech to China’s economic policy conference in November 2013, which effectively abandoned the previous stimulus policy and prepared the way for his New Normal economic direction. As I wrote then, “we cannot know if he will succeed in moving the economy towards a more sustainable future“. And the same is true, today, for Prince Mohammed’s new policies. But what is clear, is that anyone who still believes that oil prices will “inevitably” return to $100/bbl are fooling themselves, just as were those who argued in 2013 that President Xi would “inevitably” continue with “business as usual” policies.